Heavy-duty five caster dolly makes it easy to get around. Grit Guard grate system that prevents scratching from dirt. Screw-on lid lets bucket double as storage and a creeper! Wolfgang + Grit Guard® = swirl-free paint! Washing your vehicle with dirty water is like an unintentional wet-sanding! The tiny grit and sand that comes off your vehicle goes right back onto the paint every time you dip your mitt in dirty water. Keep your wash water clean with the Wolfgang™ Complete Wash System with Dolly. The Grit Guard has a radial grid surface that scrapes dirt out of your mitt or sponge. Four quadrants at the base of the Grit Guard calm the wash water and hold the grid above the bottom of the bucket. Dirt falls to the bottom and stays there. The raised radial surface fits in the bottom of any 5 gallon bucket and extracts grit from your wash mitt or sponge when you drag it across the Grit Guard. 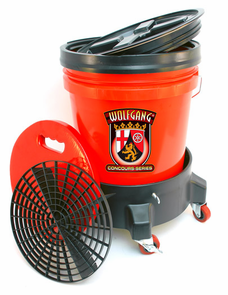 The Wolfgang Complete Wash System with Dolly includes a dolly for your convenience. Roll the bucket of wash water around the vehicle as you work. With the lid and seat cushion in place, the bucket becomes a creeper where you can sit as you detail the lower panels of your vehicle. When not in use, store your wash mitts and brushes inside the bucket and seal it with the included lid to keep wash tools clean. Closed storage will prevent dust and dirt from settling on wash tools, and then being transferred to your vehicle. Great bucket and good to sit on when working on wheels etc. Great size and grit guard is good feature. cushion is a must. Also great for storing items after you are done.